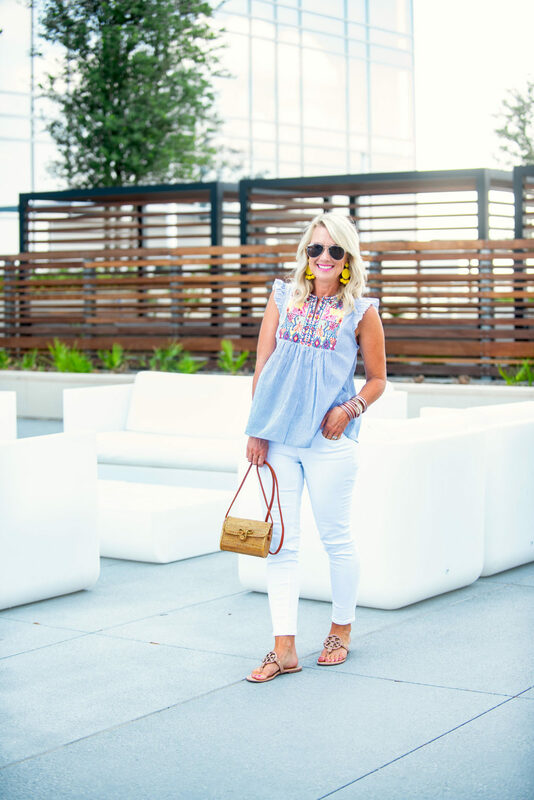 Amazon Prime Day | Fashion Deals | hi Sugarplum! We play this game over on the Hi Sugarplum Facebook page where I share the most random things in my Amazon order that week…and no matter how bizarre the mix of goods in my cart, readers always trump me!! Clearly we are all addicted (and dependent) on Amazon Prime! I use Amazon Prime for day-to-day things around the house, office supplies, pantry delivery (the best!! ), and even fashion. (Yep, they even have darling fashion!) So in honor of Amazon Prime Day, I’m sharing some of my recent finds. Awkward sidenote: I’m super excited to share this content with you, but in order for me to actually see what you click and buy (and therefore, show me what styles you like best for future posts! ), please consider viewing on your computer, or a web browser on your phone/tablet, rather than the Amazon app. Not only does shopping on the Amazon app (or any store’s app) not allow me to see what you like most, but keeps the retailer from crediting the sale to me. And those small commissions are what keep this blog going! Can you literally even believe that this top is from Amazon?? It looks like something straight out of a high-end boutique!! That’s one of the things I like most about shopping Amazon finds…they aren’t pieces you’ll see on everyone else. 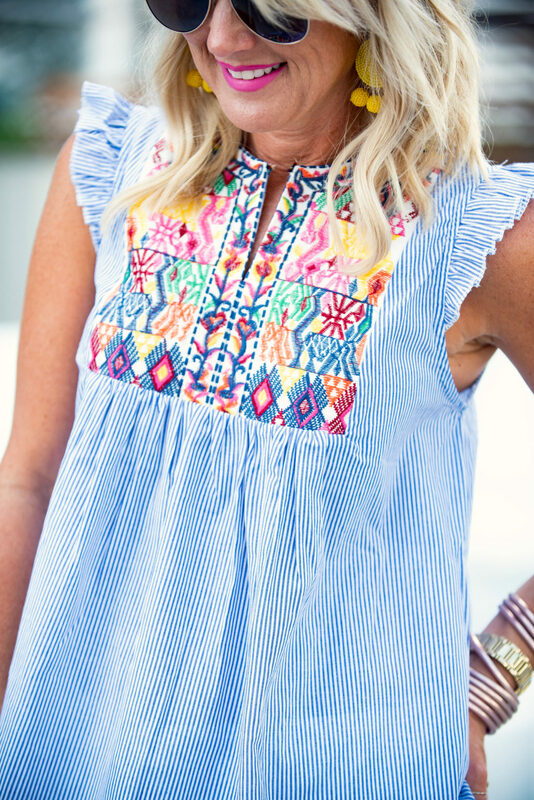 This top is lightweight and perfect for steamy days, with darling ruffle trim and embroidery. It’s incredibly well-made, even for the price. Fit Tip: I’m wearing a small. It did come with pom-pom ties, but I snipped them off for a cleaner look. Here’s a peek at the other fun finds from my latest Amazon haul! 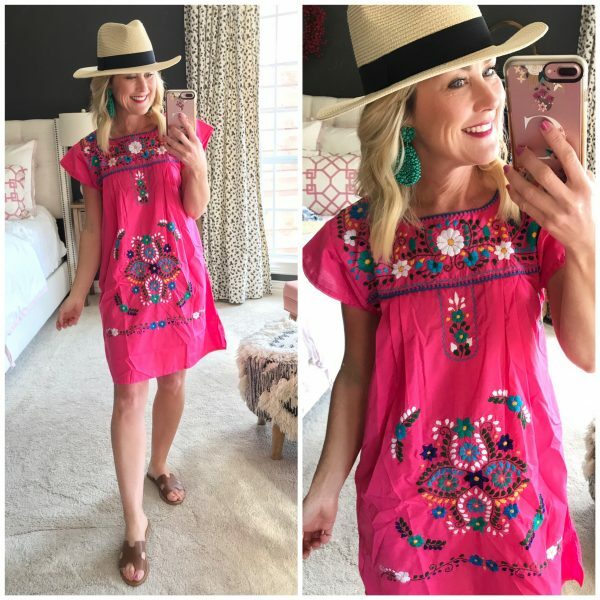 My grandmother always wore these Mexican dresses as swimsuit coverups, and looked incredibly chic. 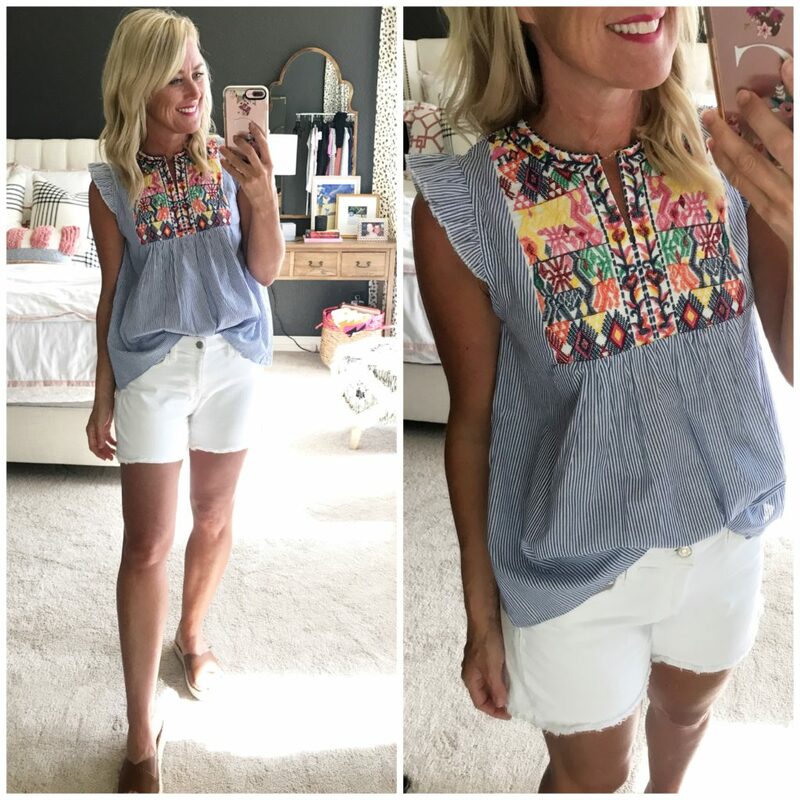 I think that’s one of the reasons I love this top so much…that and it’s just stinking cute!!! 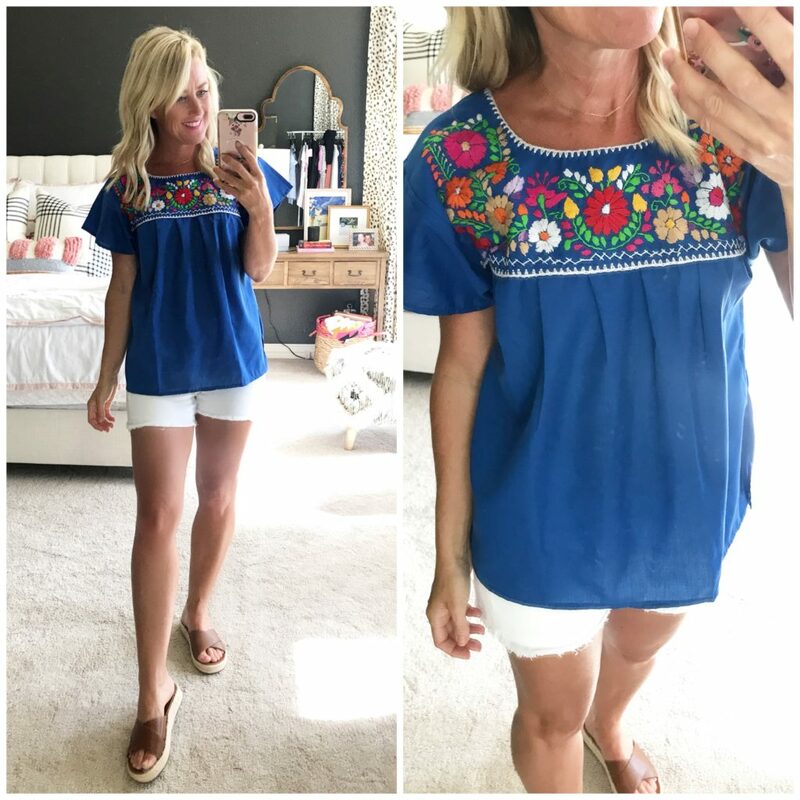 So well made and available in tons of colors! My mom is literally swooning right, I just know it! She dressed me in this collar style my entire childhood (much to my chagrin)…and of course I can’t get enough of them now! Isn’t that how it always works. Mother does know best! 😉 This top is a crisp, solid material that’s not sheer and doesn’t wrinkle easily. The shape is darling tucked in for a dressier feel, but long enough to wear untucked for a casual, but feminine vibe. 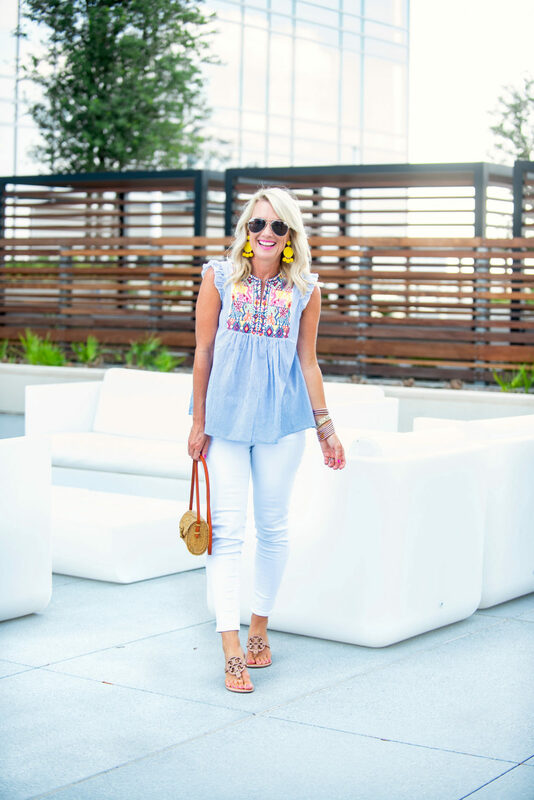 If I were a better blogger, I’d have steamed this top so you’d see it’s full potential! 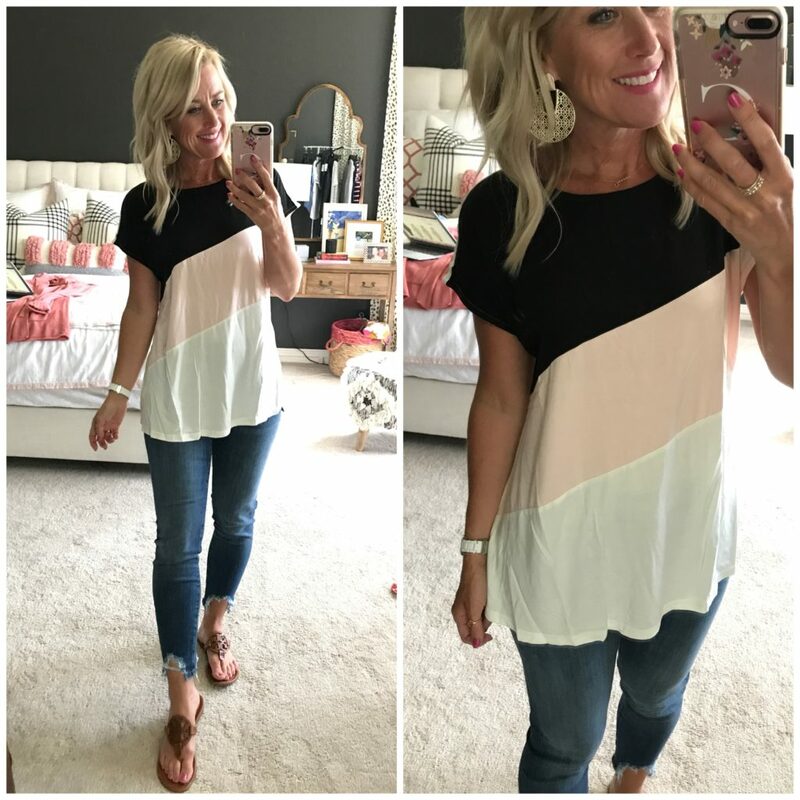 It’s silky soft jersey, with fun black, blush and ivory color blocking. The light colors aren’t sheer, and it falls away from the body just enough. Fit Tip: I’m wearing a small, but an XS would be best. 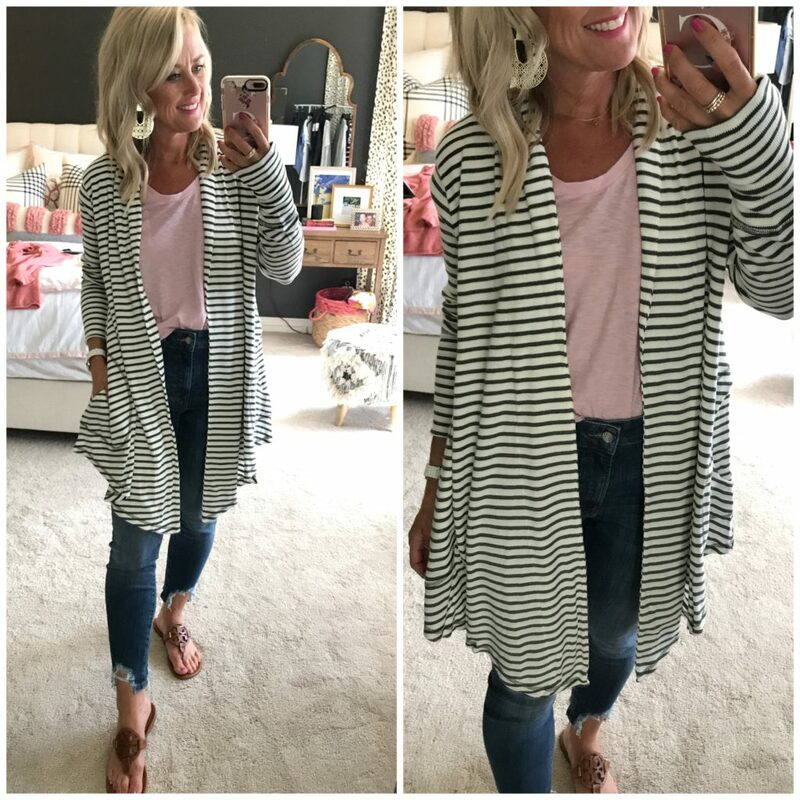 The easiest cardigan to throw on over workout wear, with jeans, or even around the house with pajamas. It’s a thick, waffle weave with pockets and a waterfall hem. 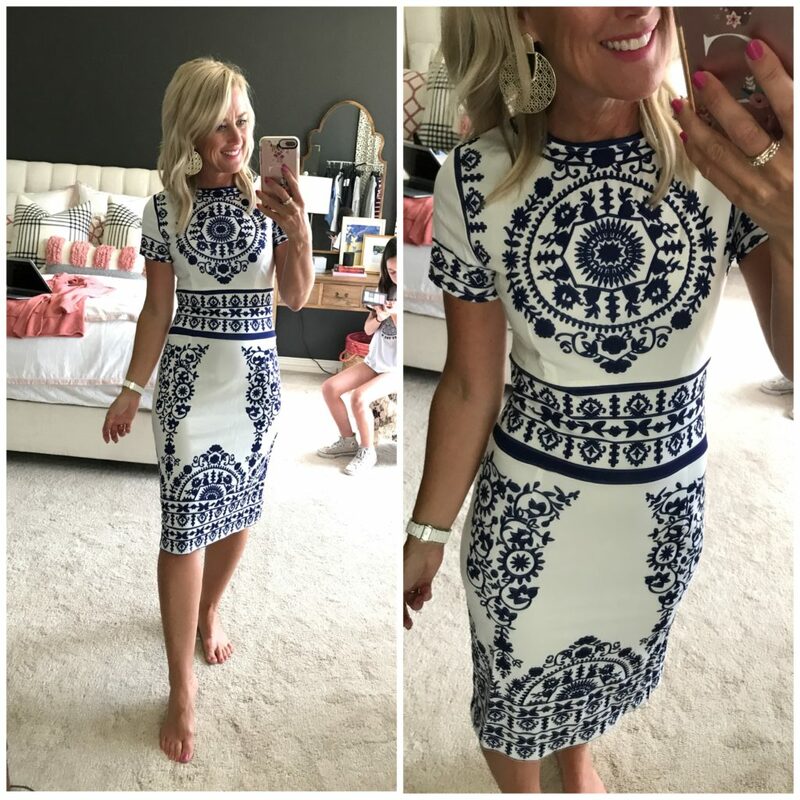 Excuse me…this chic cocktail dress is Amazon?! Yes ma’am, it is!! I adore the tiers of ruffles and ruffle sleeves, plus the flattering fit and flare shape. It’s incredibly well-made and a total showstopper! You know when you need to look pulled together, but you’re running late and feel anything BUT pulled together?! This dress is your answer. You could go from pajamas to chic with just this dress. It’s a thick stretchy material that molds to your figure, but not too body-conscious, with a flattering cut and modern pattern. It’s just below the knee for me, and zips up the back. This lightweight swing dress is a soft, jersey material that feels cool and silky. It’s a little on the thin side, so I’d stick with wearing it as a cover-up, or with sneakers to run errands. 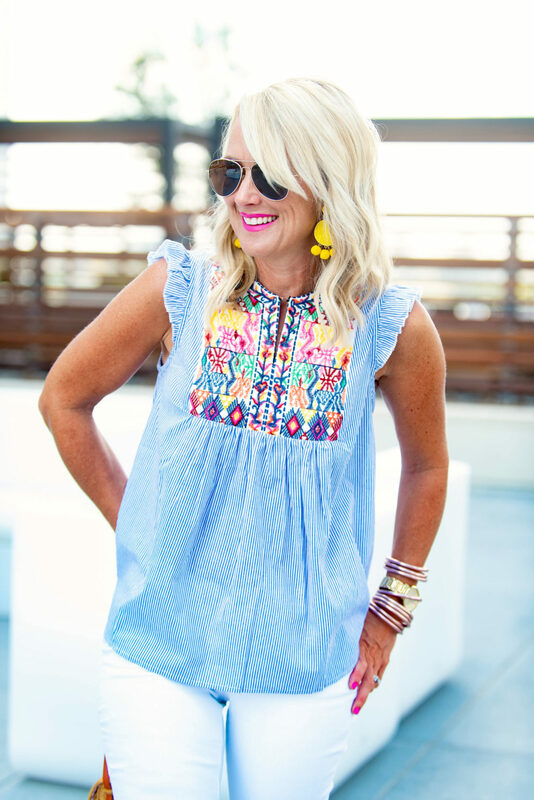 Another easy throw-on piece for busy Summer days with the kids…this jersey romper is a thick t-shirt material, but doesn’t feel too thin. The waist is both elastic and functioning drawstring, and the straps adjustable. It has pockets and a slightly longer inseam for a flattering, yet conservative fit. 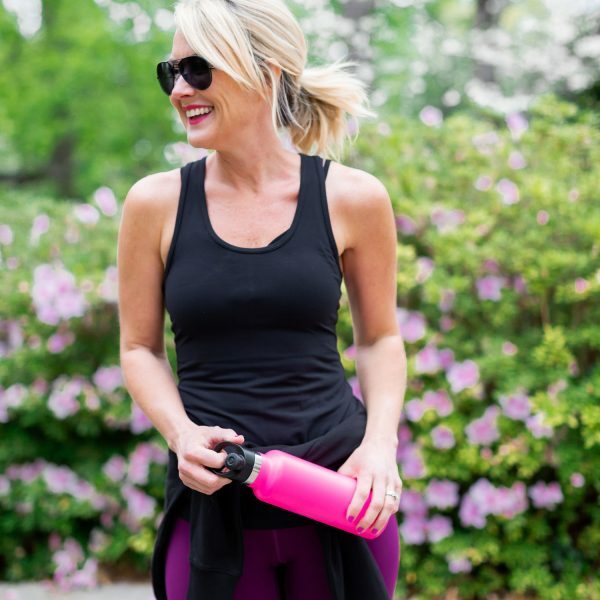 I’m not one to workout in just a sports bra, but prefer lightweight tops to stay cool, but covered. 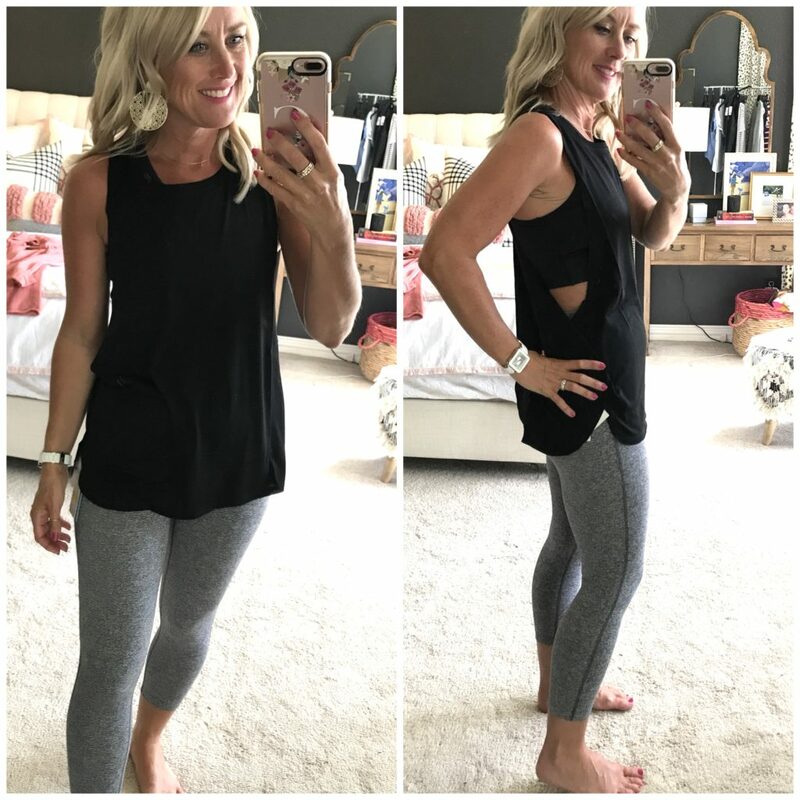 This yoga top is perfect for keeping you mostly covered, but doesn’t add any bulk or heat!! It’s a soft, lightweight material that dries quickly, and doesn’t hug the body. Fit Tip: I prefer the fit of sizing up, I’m in a small. Next up we have pajamas…because really, can you have too many pajama sets? This one is soft and thick (but not too hot!! ), with fun patterns and classic piped edging. I love that the pants aren’t overly long or wide. 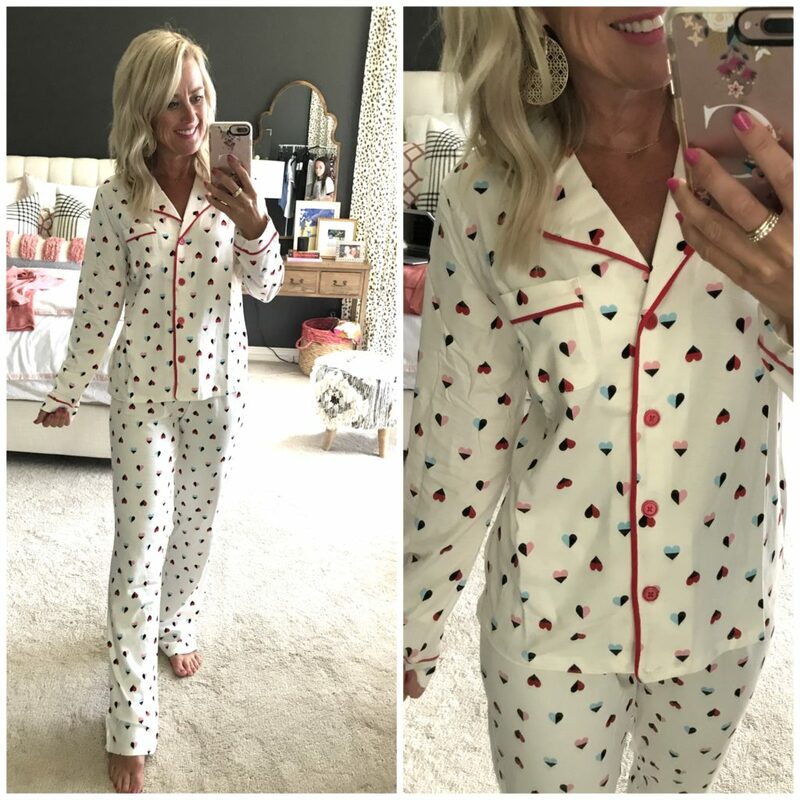 I didn’t have much hope in this pajamas shorts set, given the price….but am completely obsessed! Seriously, I want them in every color and am already dreaming of the end of the day when I can put them on again. The material is jersey soft, but doesn’t show the outline of your undies, and the shorts fully cover the bum. And as if the comfort weren’t enough, they went and made them cute with a tulip criss-cross in the back!!! And finally…you know this swimsuit has to be good if I’m sharing a pic of me in it on the internet!!! 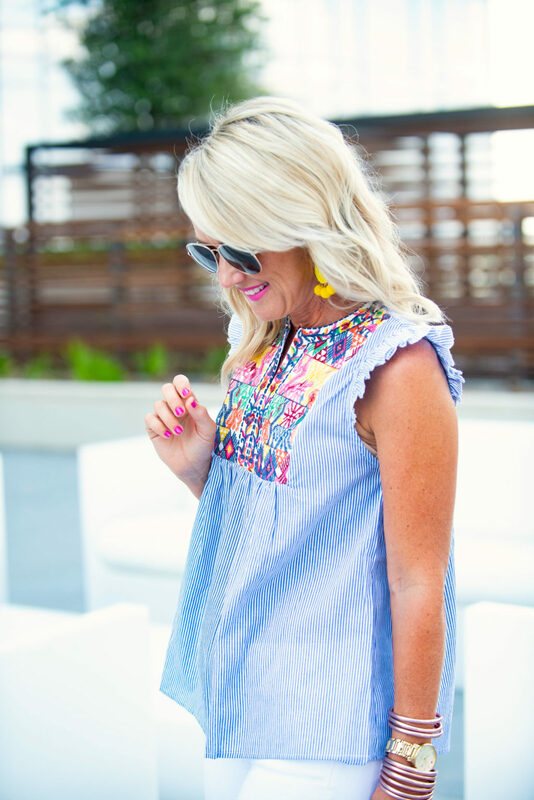 But ya’ll….how freaking cute and chic is this swimsuit?!? And it’s from AMAZON!!! The palm print is emerald green, and the lycra is thick and strong. The top is fully-padded with good support, and the ruffle goes all the way around. Fit Tip: I always size up 2 in swimsuits, so this is a medium, but I’m exchanging for a small. A few other things you need to know about…these sunglasses are seriously good dupes, these packing cubes will change the way you travel, and I challenge you to find better sheets than these! Man I love Amazon!! I’d love to hear what you’ve used Amazon for lately! What great deals are you finding for Prime Day?! See all Amazon Prime Deals here. next article: The Gibson x Hi Sugarplum Collection | Now on Sale! Have never considered Amazon for clothing. Brands and sizes seem random but perhaps will try it. The pajamas look good. Most of my Amazon shopping is for household goods and gifts for the grandkids. Best Amazon Prime Day post I’ve read all day and I’ve read a TON of them!! I ordered the dress, embroidered top, color block top and the swimsuit. Fingers crossed they work. I also bit the bullet and ordered the GibsonXHi Sugarplum! 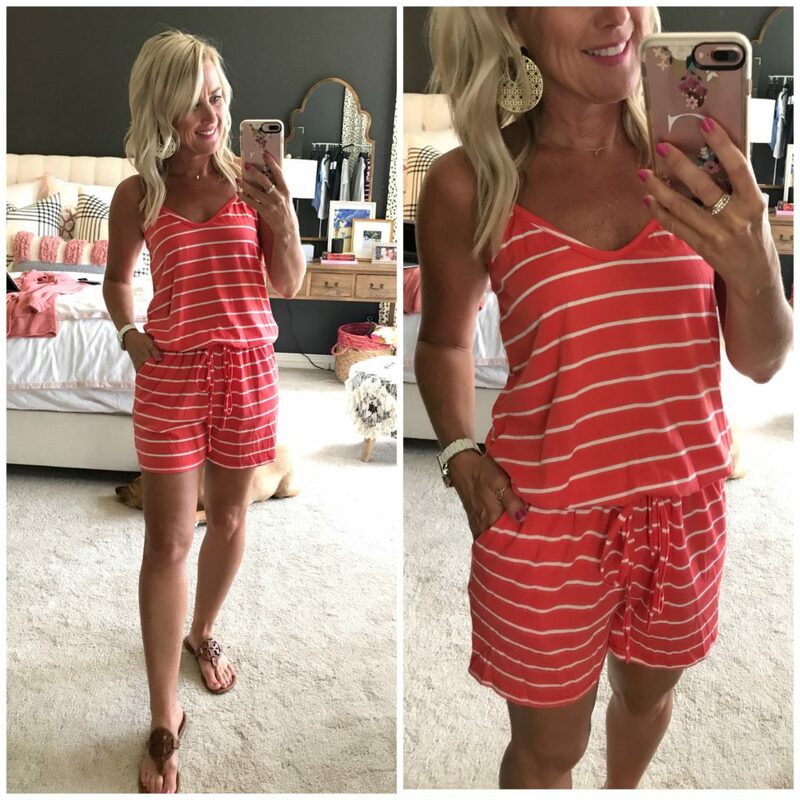 romper on opening day of the anniversary sale. I LOVE your style and yours is one of my favorite blogs, been reading for years!!! I recently found your blog and I thank you for such a fun read every few days!! One question-for the outfits that have spaghetti straps, such as the cute Amazon Prime Day romper, what kind of bra do you recommend? As a 25 year old I would have not worn a bra, but as a 43 year old mom of three I am learning that what was will never be again!! 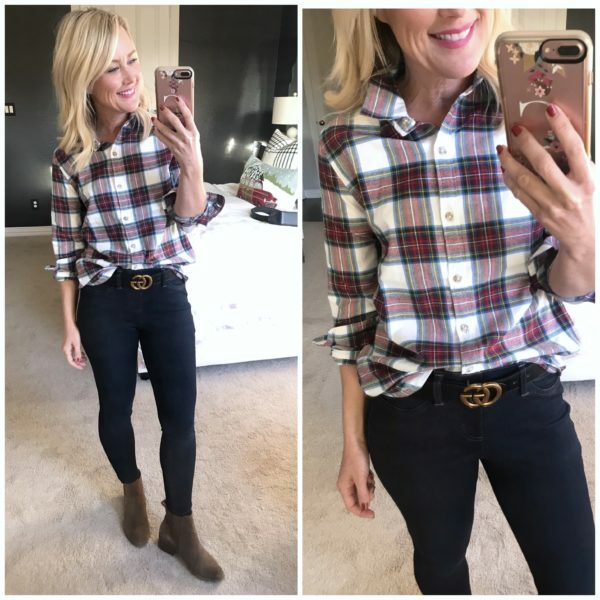 Thank you for your sharing your advice, comments, and great style. I wish I’d known about the mobile site issue! I’d hate for you to be penalized because I only use my phone. From now on I’ll make sure I access Amazon from desktop only; I WANT you to get credit as I love your picks. 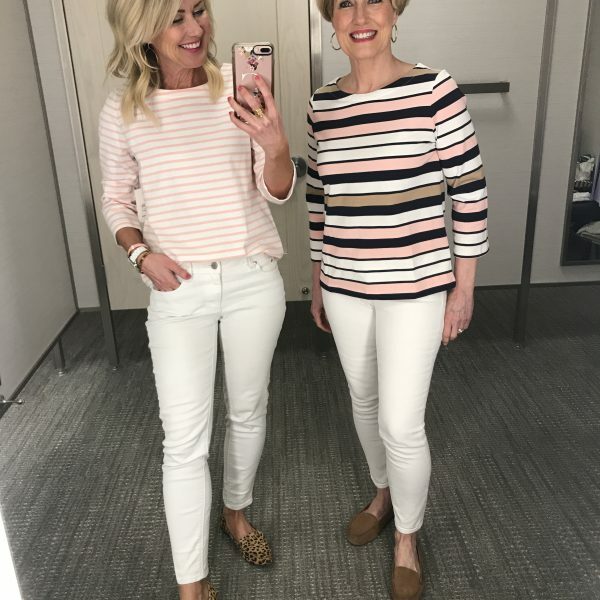 I’m almost 50 and have an extreme hourglass build so I always monitor what your mom is wearing–I’m much closer to her shape. But I enjoy your style and many accoutrements–shoes, earrings, bags–cross over. I’m glad you shared this “glitch.” Now, let me get myself to my desktop and buy a few things! Post well done! You look so great in that palm leaf swimsuit, hot mama! I don’t know of anyone who looks cuter in a bathing suit than you! Kathy’s spot on! And you deserve all the commissions in the world! 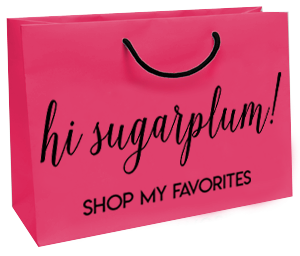 I use my desktop to shop directly from your hi sugarplum blog so that you get the credit. Why else would we be shopping in the first place for the things you show us that are so adorable? I hope you have a supremely spectacular Tuesday! Amazon seems overwhelming to shop for clothes. I love that you do it for us. I ordered 3 of these tops in this post. I have got to stop ! That bathing suit is PERFECTION on you!! 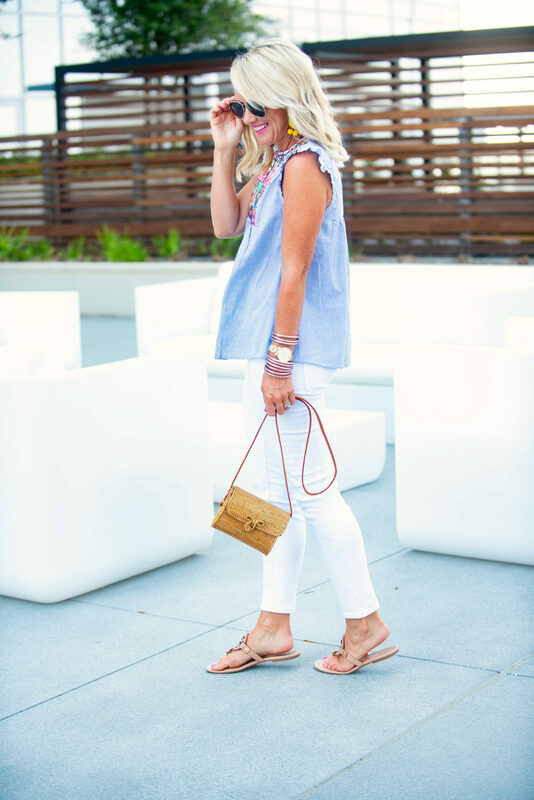 I’m loving so many of these pieces and definitely have this first tank in my cart now…. thanks for the finds! That bathing suit is darling! When I look at it on amazon, it looks a bit cheeky. How much coverage does it have in the back in real life? Great post! 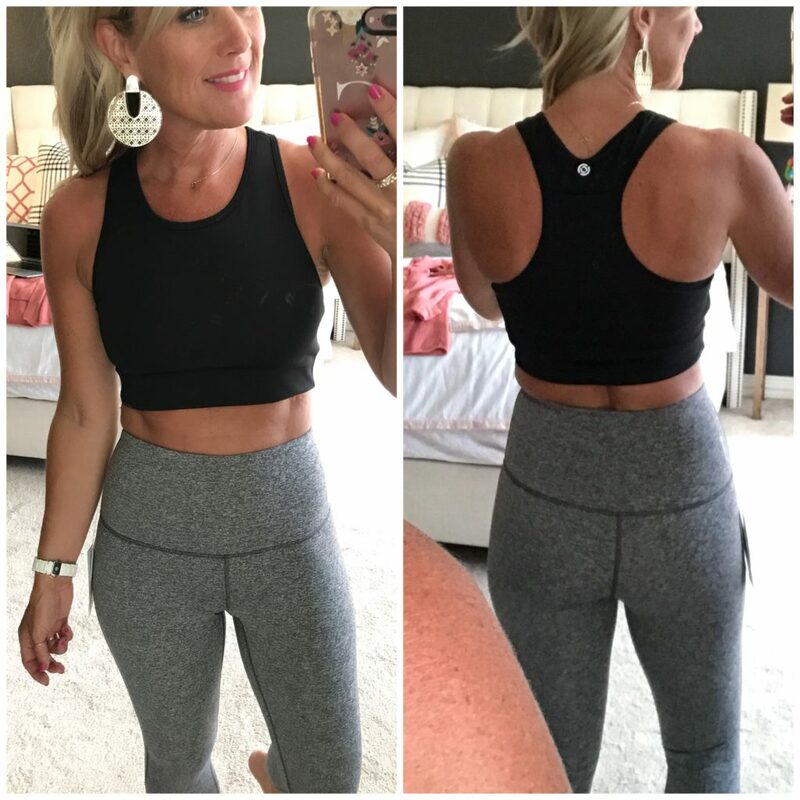 Question on the sports bra: does it have any kind of built in or removable padding? Love the back pocket but also need more coverage (no headlights!) than just the sports bra material. Thanks!! Just thought I should let you know that when I clicked on your comments about the packing cubes and ordered them, I didn’t realize that I ordered Travelwise packing cubes instead of the ebags you recommend. Some how Amazon switched it up. When my order arrived, not only was it the wrong bags, but the wrong color. I have returned them, but just wondered if that happened to anyone else. Just received my amazon top -light blue stripes with the embroidered neck featured in the blog post- very disappointed. It’s worse than old navy quality. It has a Shien (China manufactured) tag in it and the fabric is terrible and it doesn’t look anything like Cassidy’s. I think all the China “deals” are too inconsistent in quality. They definitely aren’t life-long pieces, but I’m okay with them being single season or two pieces considering they’re under $20 usually. I’m sorry that one didn’t work out for you! 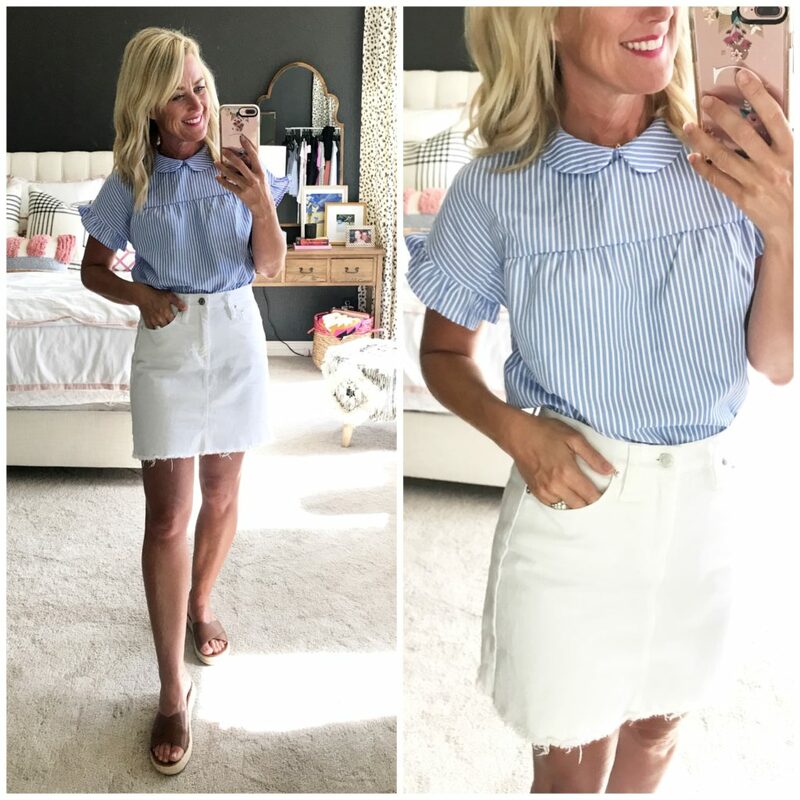 Thanks to this post I am currently wearing the childhood collar striped top (I purchased the blk gingham style) and am *LOVING* it. I am wearing it untucked w/ raw hem skinnies and blk flat slingback Zara espadrilles. Thanks for always posting great content!!! Yay! I’m thrilled you loved it! !